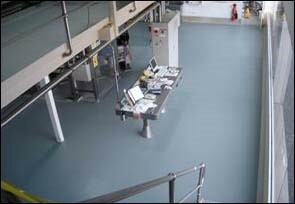 Applied in one application to any thickness and curing in minutes a Rhino Linings Industrial floor can significantly reduce costly down time. 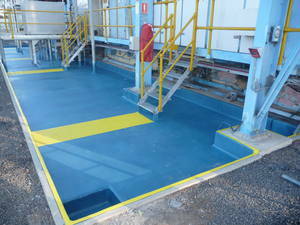 Rhino Linings superior spray applied Industrial floor linings will not crack, peel or warp. They are highly resistant to impact, abrasion, oils, fuels and most chemicals. 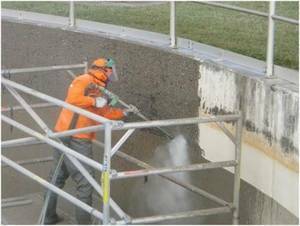 Being spray applied they are seamless and application is rapid. The instant curing nature of Rhino Linings Products dramatically reduces down time normally associated with multiple coat flooring systems. Rhino Linings flexible, seamless and impervious linings offer an incredibly strong and easy to apply solution to meeting EPA requirements and will provide long term cost effective protection for your company’s assets.